The place, where this wine, is made is wonderful, the vineyards are very near the very famous castle named “Le Castella”, in front of Ionian Sea, and to the old village of “Isola Capo Rizzuto”. The wine is called “Sant’Anna”. 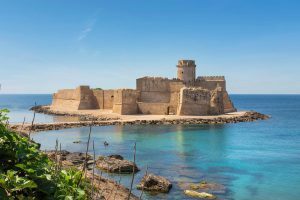 The DOC of “Sant’Anna di Isola di Capo Rizzuto” is located south of the municipality of Melissa, and the village was once on an island (in Italian “Isola”), but overtime the marshland around it filled in and connected the region to the mainland. Precisely, S.Anna DOC wine of “Isola Capo Rizzuto” is named after the municipality of Sant’Anna, on Calabria’s eastern coastline, but this village is also simply said “Isola Capo Rizzuto”. The DOC area produces dry red and rosé wines from Gaglioppo, Nocera, Nerello Mascalese (and the related Nerello Cappuccio), and up to 35% of added Malvasia and Greco bianco. Therefore, the wine is made from a mixture of Gaglioppo and many other varieties cultivated on these hills on the Ionian side of Calabria, southeast of Crotone, one of the most important cities of the region. The DOC title was introduced in January 1979, just a few months prior to its neighbor Melissa, 30 miles (48km) up the Ionian Sea coast to the north. It covers exclusively red (rosso) and rose (rosato) wines made from a combination of indigenous vine varieties; white (bianco) wines from the area are sold under IGT and similar protection titles. In recent decades, winemaking has expanded through the application of an economic development plan that originally emphasized small family holdings but now promotes more extensive and rational vineyards. However, the most fascinating thing is that winemaking in this area has roots both in Greek history and in myth. Indeed, the vines grow in large area near the archaeological site of the single, massive column of the huge “Temple of Hera Lacinia”, which is all that remains of the extremely ancient Greek power of the city of Croton. Near the column were found many coins and the symbol most extensively used on those coins was the tripod of the oracle of Delphi, a reminder of the legendary origins of the area. The entire site is the glorious land of the home of Pythagoras and Milo. The winemaking has the same roots in the Greek cult of the goddess, which now survives, in modified form, in the devotion paid to the Black Madonna in ceremonies held each May in the ruins of the ancient temple. The numerous objects discovered in excavations of ancient Greek ruins of the DOC area can be admired at the city’s “Museo Civico” of Croton, which also has a fine collection of the coins struck by the colony. Further, in the area of “Isola Capo Rizzuto”, in the middle Ages, the Benedictines founded numerous monasteries, all throughout the territory, and made a considerable contribution to grape growing and winemaking, since all of the institutions had vineyards to supply their own needs in wine. After century of steady improvement in quality, the wine’s reputation began to spread beyond the immediate area. In addition, its standing was further promoted by some famous figures in history. It is said that, after entering the area with an army, Emperor Frederik Barbarossa found that wine was so plentiful and the food so good, that he remained there for six mouths. As afore mentioned, the island in the name “Isola” is something of a misnomer, as the ‘island’ in question is in fact a peninsula: the Capo Rizzuto, which completes the DOC title, is such peninsula. This kind of peninsula, named as an island, also occupies a special place in Mediterranean geography, not only as one of Italy’s most easterly points, but also because it overlooks the Gulf of Taranto to the north, the Gulf of Squillace to the west, and the Ionian Sea to the east. 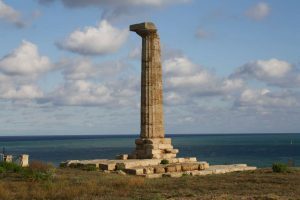 It is not superfluous to remember that the very beautiful coastline around S.Anna is not only a vital component in the local terroir; it is also a highly successful summer tourist attraction. This special topography makes that the Mediterranean Sea helps to moderate the intense heat of the south Italian summer, therefore the cooling and heating of the land over the course of a summer day causes morning and afternoon breezes that are channelled by the subtly undulating place. The continue cooling minimizes the risk of fungal vine diseases, typical of humid climates, and further improves the climate’s suitability for quality viticulture. S.Anna di Isola Capo Rizzuto is one of the coat of arms of Isola di Capo Rizzuto; this key vine variety uses Gaglioppo, which accounts for between 40% and 60% of any blend. This grape, – although it is entirely unrelated to either the Petite Arvine of the Swiss Valais, or the Aglianico which has made its name around Vulture in Basilicata, – is locally known by several synonyms including Arvino and Aglianico. The other grapes, which are employed in the blend, are any combination of six other ones (four red and two white): Nocera, Nerello Mascalese, Nerello Cappuccio and Malvasia Nera are the red varieties, Greco Nero and Malvasia Bianca the white varieties. The presence of white grapes in the blend of Sant’Anna DOC can be surprising. It seems unusual that that a deep, red wine from the south of Italy can be made with a portion of white grapes. Anyway, in winemaking it is common: for example, the robust reds of the northern Rhone valley are often made more alluring with an addition of white grapes (i.e. “Viognier”), sometimes as much as 20%. We proudly present our line of Authentic Calabrian Olive Oils: SMAF Ltd selection. All these oils are extra-virgin, and of two main types: Regular and Biological. 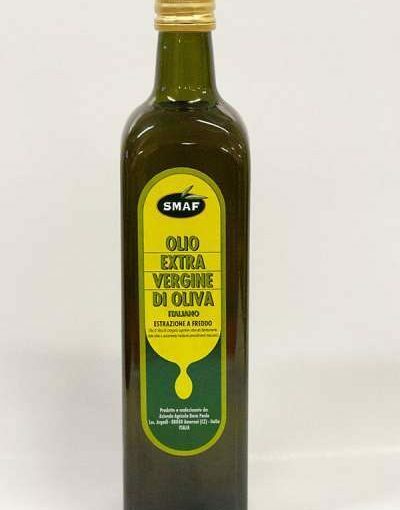 SMAF LTD deals with all the olive oils labelled in Calabrian DOPs. However, among the oils, stand out the Calabrian “extra-virgin oil”, regular or biological. Calabria is, now, the source of 25% PRODUCTION OF ITALIAN OLIVE OIL; at the same time, among the top six olive oil of the world, two are Calabrian, and, commercially, Calabrian oil is sold to wholesalers who take this dense, robust Calabrian olive oil and mix it with that of other regions. Generally speaking, Calabrian olive oil is a very safe and HEALTHY FOOD for the every-day life, providing monounsaturated fats, which can naturally lower cholesterol and risk of heart disease. Further, extra-virgin oil contains antioxidants very useful for said heart healthy. This wholesome antioxidant-rich product also contains vitamin E, renowned for its anti-cholesterol and anti anti-ageing effect. Dubbed as olive oil’s most beneficial health component, its polyphenols are potent antioxidants that neutralize free radicals in the body and reduce the risk of heart disease, high blood pressure, digestive problems and certain types of cancer. As a SYMBOL OF THE MEDITERRANEAN DIET, Calabrian extra virgin olive oil represents an important addition to export product range of Calabria. Its finest Organic Olives are carefully selected and cold pressed – enjoying all the full, fruity flavours of this healthy oil. Calabrian Extra Virgin Olive Oil have colors ranging from green to straw-yellow and has a distinct fruity flavor and aroma with a slight tinge of bitterness. After careful growing, a delicate harvesting by hand, and cold pressing in cutting-edge olive press, Calabrian extra virgin olive oil fully reflects authentic tastes and aromas of the land, where the trees grew. In fact, two mains, typical Calabrian Olive Varieties are CAROLEA and NOCELLARA. Traditionally, these two type of olive trees have always had a symbiotic relationship with grapevines. Therefore, the interaction of the plants with the nearby environment influences the low acidity and a nice depth scent combined with a certain refinement of delicate tones of the oil. Calabrian oil are normally “fruity” with hints of almonds and artichokes as well as a pleasantly spicy note. This rare spicy note is sometimes called ‘pizzicante’ flavour of extra virgin olive oil, and is very important as an indication that the oil is rich in polyphenols. Further, this luscious oil always features fragrant hints of almonds, basil and parsley, and notes of artichoke, lettuce, wild thistle and chicory. In GASTRONOMY Calabrian olive oil is ideal on fish and in fish sauces, but also substantial enough to match nicely with meat, game, and vegetables. Extremely tasty, this oil is ideal to enhance the flavour of a wide variety of dishes, from pasta to meat courses, cheeses and bruschettas. Especially, extra virgin olive oil from Calabria is ideal when paired with shrimp, lobster, turbot and sea bream, mushrooms, soft cheese, mayonnaise, couscous and yeast-raised cakes. Finally, sweet and fragrant, this aromatic oil will glorify the flavor of any dish to the fullest, embodying a well-balanced bitterness with a light spicy aftertaste. The typical way to produce Calabrian oil are two: MULTICULTIVAR or MONOCULTIVAR. The latter means that oil is made from a single variety of olives harvested (during the peak of Calabrian Autumn in October) from olive trees grown in the exquisite clay soil of the Calabrian region. All the extra virgin olive oils produced in Calabria derive from cold pressing of olives, without the use of heat or chemicals. This ensures that oils maintain an acidity level of less than 0.8% and retain all the positive nutritional benefits of the olives, including good cholesterol, vitamin E and anti-inflammatory properties. 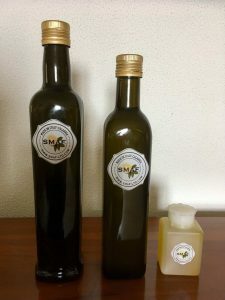 SMAF LTD is an intermediary of Calabrian olive oil corresponding to the trade names provided for in Directive 136/6623 / EEC, Reg. EC 2568/91 and Reg. EC 1989/03. Saffron oil and derivatives of saffron oil of raw olives. SMAF Associates LTD operates in the Calabrian extra virgin olive oil sector as a mediator – national and international “Broker”. Our activity towards Calabrian extra virgin olive oil comes from a long experience in the agricultural products market, in the activities of buying, selling, import-export, logistics, sea-to-land transport, insurance and customs issues. Our brokerage deals with import-export to USA, Canada, Europe and Eastern countries, from Calabria, Italy, for quality fruit and vegetables of the best brands. We give the right importance to quality Calabrian extra virgin olive oil by transporting it directly from the manufacturer. We guarantee our business partners the utmost seriousness and we have clients of great international prestige. Among the other brokerage countries: Argentina, Australia, Belgium, Brazil, Canada, Chile, China, Croatia, Egypt, Ethiopia, Philippines, France, Germany, Great Britain, India, Lithuania, Morocco, Mexico, Myanmar, Slovenia, Spain, Thailand, Turkey, Ukraine, Hungary, USA and Vietnam. Our company is the leader in the distribution of Calabrian extra virgin olive oil. The presence of liaison offices in Calabria ensures us a strategic position for the supply and distribution of goods. We are the privileged interlocutor for the Commercial and Collective Catering World and all the business forms that need a service high level as well as a constant and customized quality standard.